Today I’m working with a team of technical support personnel, who are not educators, and introducing some ideas they can use to help support teachers in their use of technology. I was reminded this morning of the Thinking Through a Lesson Protocol (TTAL) developed by Peg Smith, Victoria Bill, and Elizabeth Hughes it occurred to me that this is the kind of tool that could be useful for educators to use when planning lessons to decide if they should have a technology component (and for educational technologists to recommend to teachers to use when planning lessons involving technology). Shoe-horn it into a lesson even if it didn’t always make sense. Wonder why my students didn’t learn a whole lot from the activity. The advantage of the TTAL protocol is that it puts the goal or focus first and helps prompt someone planning a lesson to think through how each part of their lesson supports their overall goals for students. I also think that although the TTAL protocol was originally developed for use developing lessons with a mathematical focus, it could be fairly easily adapted to be more content-agnostic. Set up and select a task based on your goal. Support students doing the task. Share and discuss the task. I recommend reading the entire protocol because there is obviously more nuance to the protocol than what I am describing. For example, the TTAL protocol recommends that you do the activity you are planning for students to do, both how you would do it with your knowledge and experience but also to anticipate how your students would do the task with their different knowledge and experience. 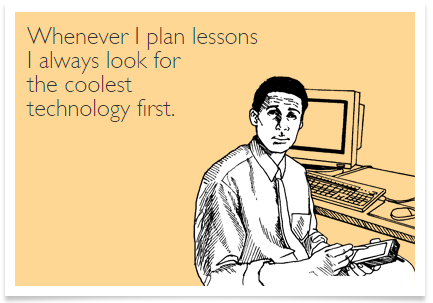 A critical idea to keep in mind when making choices about activities for lessons, including ones that involve technology; what your students think about is what they will remember and what they remember will dictate what they will be able to do.